We are getting ready for another summer trying to have a lush lawn and garden while keeping our water bills manageable! Learn how to water effectively. Often, people water too much, too often, at the wrong times, and the wrong way. Not only does this waste a valuable and increasingly scarce resource, it also makes your lawn look worse by increasing disease, insect, and thatch problems. If you water every other day, the grass thinks, “I will drink again tomorrow. Why bother to make long, thick roots and work hard?” On the other hand, if you water less frequently but apply more, the grass will produce a deeper, healthy root system, and your water bill will decrease. So, everyone wins. How Long Should I Run My Sprinkler? Run your sprinkler and see how long it takes to get a half inch of water in the can – just like a rain gauge. Usually it’s about 30 minutes. So, 20 minutes, 3 times per week will get an inch of water on your lawn, and 30 minutes 3 times per week will get 1 ½” on your lawn. Along with mowing the grass too short, watering at night is actually determinantal to your lawn. Homeowners who can’t water in the mornings before work should do it on a weekend morning. The best time is early in the morning: 4 a.m. to 10 a.m.
Take time to observe your irrigation system. Note where water delivery is coating hard surfaces, like walks or driveways, or where puddling is occurring on the lawn. Adjust nozzles and irrigation duration as needed to ensure you’re making the most efficient use of every drop of water. Reset your irrigation timer monthly. This is one of the most overlooked aspects of a lawn irrigation system. Don’t let your system run on summer settings once your region’s rainy season arrives. Cost isn’t the only concern. Dr. Gene Taylor from Texas A&M communicates some thought-provoking statistics on water. By the year 2035, Texas will have available only about 85 percent of the water it will require. About 35 percent of the water we now use in the summer goes to landscape. The population of Texas is projected to double in the next 50 years. All of the above reinforce our need to conserve water. And there are more short-term benefits to being frugal with water, too. Decreased incidence of turf disease. Deeper roots, which help turf better withstand drought stress. Overall better turf quality; more problems are caused by over-watering than under-watering. Over-watering is a frequent problem that can easily be remedied to the benefit of your lawn and checkbook. Here are some water conservation tips. 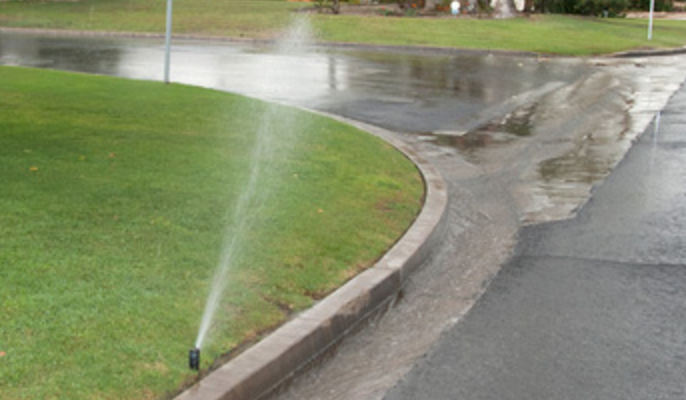 Check your sprinkler system frequently for damaged heads, or heads that are watering the street, sidewalk, etc. Evaluate performance by knowing how long it takes your system to provide one inch of water to the grass. Irrigate based on the weather rather than by automatic timer. Don’t water if it has rained enough to give the grass one inch of water in the last week.